At lunchtime today I made my way to the Ranny Williams Centre on Hope Road, where the Jamaica Cultural Development Commission’s Independence celebrations were in full swing. A drumming group with energetic young dancers was on stage as I arrived – performing to hundreds of empty yellow metal chairs in rows. I found this rather sad, but it was simply too hot to sit out there and listen. Just one woman and her two children huddled under an umbrella in the front row, the sum total of their audience. The second annual Auntie Roachy Lit Fest (I hope it will become an annual event?) was housed under a tent – reasonably cool, although the strong wind blew puffs of dust around us. I wished I had worn a dust mask – I have developed allergies lately, thanks to the heat and drought. I noticed the parking lot officials were wearing masks. Yet, despite the hostile environment, we were laughing under our windy roof. We had books, and some excellent authors to keep us company, you see. As she did last year, publisher and purveyor of all things bookish Tanya Batson-Savage, of Blue Moon Publishing, was our witty MC, aided and abetted by Ms. Scarlette Beharie in a snazzy bandana skirt. The audience was a mixture of families and book lovers; and the children were there. This was just as well, because children’s book author Kellie Magnus (whom Ms. Batson-Savage introduced as “the venerable” – a word that does not fit her at all!) launched straight into one of her three “Little Lion” books, written for the under-eights. A fourth in the series is due at year-end. (l-r Roland Watson-Grant, Gwyneth Harold Davidson and Coleen Smith-Dennis prepare their readings. Kellie Magnus brought on a boy from the front row (perhaps pre-selected?) to “interpret” her reading. In other words, he acted out the part of Zachariah Zion, otherwise known as Little Lion. Since the story had an athletics theme, Nathaniel duly ran, jumped, stretched and indulged in various facial expressions – shock, excitement, happiness. The audience obliged with a nice syncopated handclap beat in parts of his performance. Nathaniel should consider a career in mime, when he grows up. This little boy loved the storytelling session. In the background is children’s author Kellie Magnus. Next was A-dZiko Simba Gegele, the author of “All Over Again,” an award-winning coming-of-age story from Blue Moon Publishing. This was a storytelling session – no book in sight. Adults and children joined in; in fact, the grownups enjoyed it as much as the children. Again, the main character was a lion, which a woman at the back suggested might be 200 years old. The storyteller went along with that, and the story morphed into a race between a donkey (who spent too much time by the wayside, eating grass) and a very determined toad, who hopped along (the children interjected with cries of “ribbit! ribbit!”). There was great use of repetition, and the interaction with the audience was quick fire – but never out of control. I’m not quite sure how the tale ended, but it did end with the traditional: “Jack Mandora – mi nuh choose none!” (a kind of disclaimer, if you will). Then on to the Young Adults books. It’s a difficult category; I cannot imagine writing anything for that age group, preoccupied as they are with video games, television and teen fashion, and with an attention span of three minutes or less (the length of a short video on YouTube). Tricky! Gwyneth Harold Davidson began by reading from her book “Young Heroes of the Caribbean,” a fictional view of some key episodes in the lives of young national heroes. 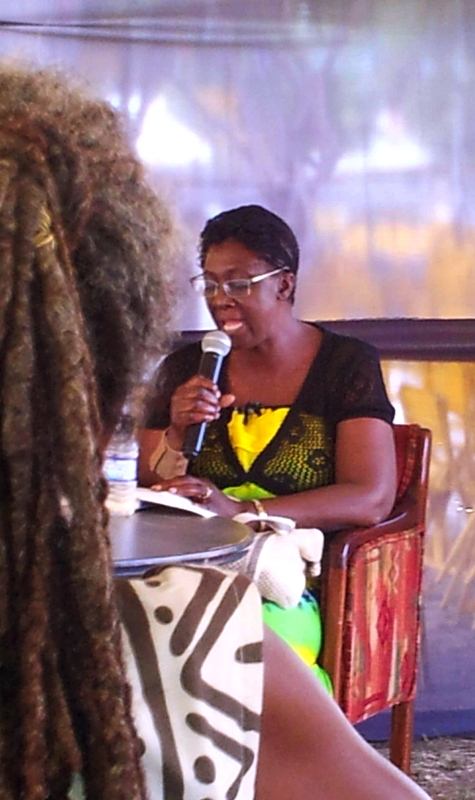 “It’s fiction, but the characters are real people,” she explained, as she described a watershed event in the life of Jamaican National Hero George William Gordon. 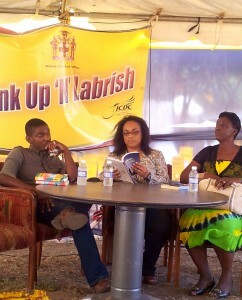 Coleen Smith-Dennis reads, and A-dZiko listens. Sitting by Gwyneth’s side, Coleen Smith-Dennis read from her novel “Inner City Girl.” In the first chapter, a young girl has passed her GSAT and is looking at an exciting educational opportunity, but is torn between her mother’s lack of faith in her ability and her teacher’s firm belief that she can take on the challenge. Apart from the realistic dialogue, I really enjoyed the descriptions of the women in conversation over the young girl’s future – lots of great, character-revealing detail. The end of the young people’s segment was left to two men. Roland Watson-Grant read about a kitchen full of intimidating (but funny) “prayer warriors,” brought by the young and recalcitrant Skid Beaumont’s mother to knock some sense into him, from his novel “Skid”. The ghost of Skid’s father hovers around in the background. Amusingly, when the author asked audience members to put up their hand if they had been, at least occasionally, “bad” boys or girls, who needed a touch of disciplining from their parents. Everyone looked at each other, hesitated. Only one or two people put their hands up. So they were all little angels in their teenage years, it appears? I suppose they did not want to look “bad” in front of the children. It’s hard, very hard these days, to get young people to open a book, sit down and read it. So, there has to be another way. 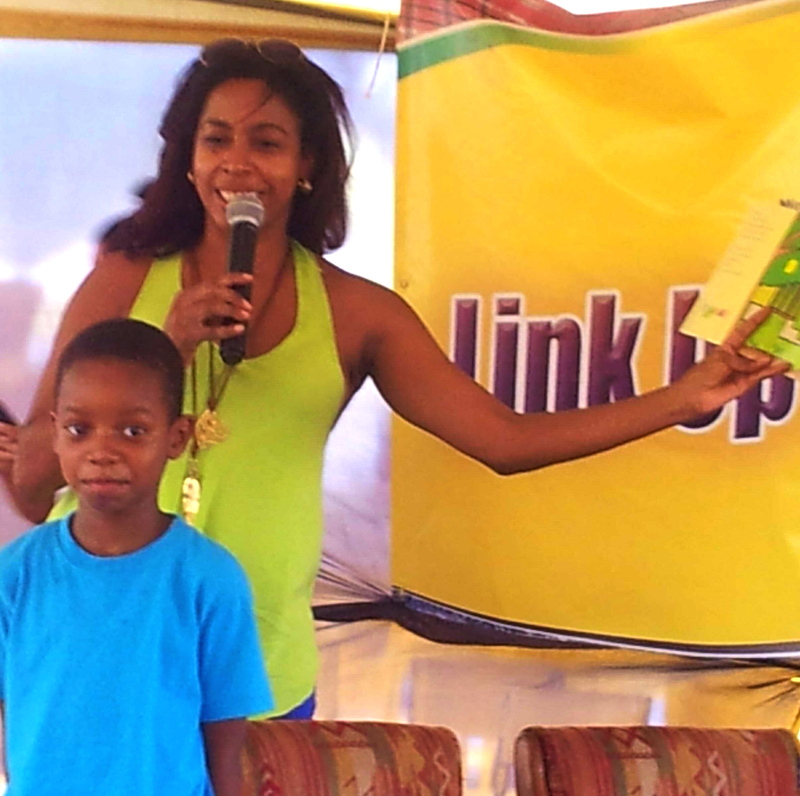 Judging from the highly entertaining readings by the authors at Auntie Roachy, reading aloud – and actually performing sections of a book – can work, at least for the younger ones. In other words, you have to really bring it to life by making interpersonal connections. Perhaps the creative use of multimedia could work, too. It’s a challenge; it requires imagination and energy to get a child involved in a book. As for me, I used to devour books, sitting cross-legged on the lawn or sprawled on the bed, sometimes reading under the covers by the light of a flashlight after the lights were turned out. Seriously! But then, perhaps I was an unusual child, a “bookworm.” I never needed to be coaxed. On the other hand, I shunned any kind of physical activity – but that’s another story. 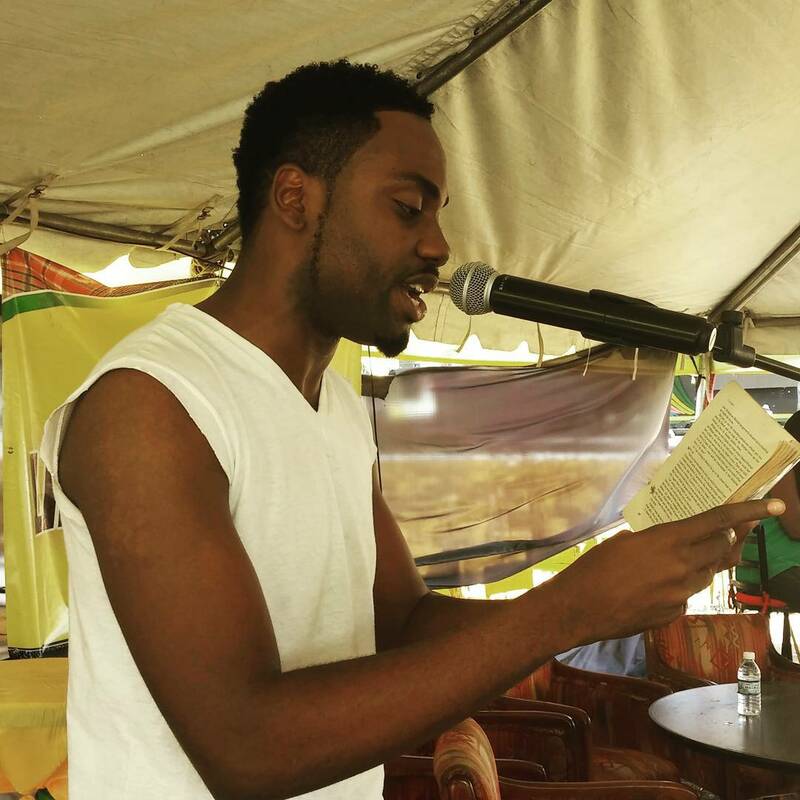 So young actor Akeem Mignott rounded things off with a passionate reading from Vic Reid’s 1949 historical novel “New Day,” honoring the 150th anniversary of the Morant Bay Rebellion, led by National Hero Paul Bogle. Well, that was the end of the children’s section. At this point, my allergies overwhelmed me, and I made my way home. As I left, the redoubtable members of the Poetry Society of Jamaica were gearing up for a “lyrically rich” half-hour performance. I am sorry I missed them. 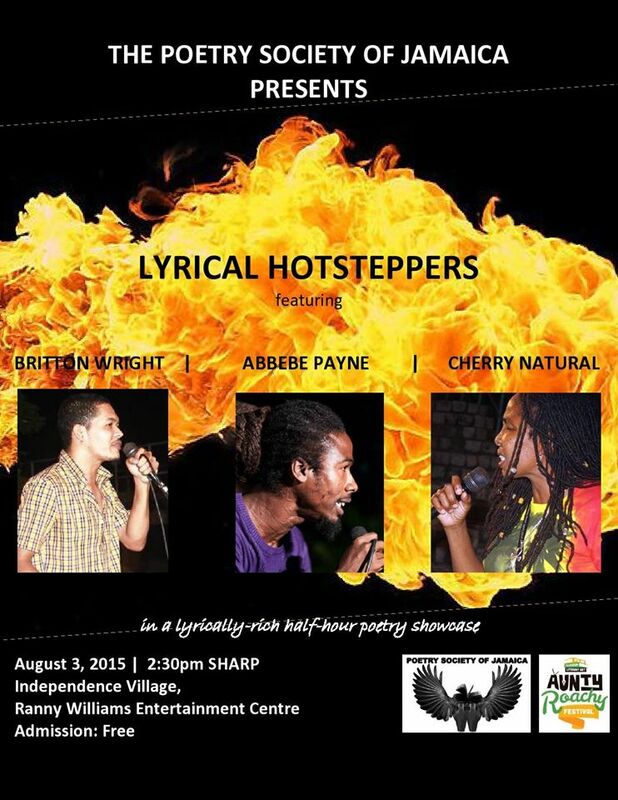 Making my way through the swirls of dust, I murmured to myself: “Jack Mandora – mi nuh choose none.” In the background, I heard the poets warming up. Thank you, as always, for writing about the events that you attend. The blowing dust on that day was indeed memorable. The inclusion of Young Adult books at the 2015 e Roachie festival may turn out to be a watershed moment for the publishing of this genre of books in Jamaica. I laid out a collection of about a dozen books that I thought could fit into that genre at the YA Hangout booth to see what people picked up and what they wanted to talk about. The result was, as you would expect, mixed. With regards to your observation on the shorter attention spans of young people today, I think it affects almost every activity, in different ways, even in sports. Creative people who wish to engage others in their ideas have to successfully adapt to this. I will write more about my experience from having a book booth at the Independence Village on my blog later on.